Yes, that there in the title is the name of a spirit…a SPIRIT!? You ask such a question since I’ve never written about any spirits in the long history of Vinopanion, except for the occasional mention of Bourbon, after the previously enjoyed wine and Port, ahem, or something. Yet, I am finally throwing down the spirit gauntlet (goblet? ), and am excited to talk about the Peruvian grape-distilled spirit known as Pisco. Yet, discussing the fine premium aspects of true Pisco does not put a slash across my wine-writing obsession, it merely adds to the annals of my vinous discovery. For what is Pisco distilled from? Come now…you must have guessed it by now: grapes! Pisco is the national grape brandy of Peru and as such, is as highly regulated for quality and style as the finest and more widely known grape-distilled spirits found across the fine continent of Europe. 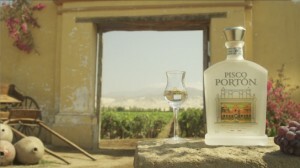 I was fortunate enough to receive a sample bottle of the very fine Pisco Portón (Twitter, Facebook, YouTube), crafted by Hacienda La Caravedo in Ica, Peru, courtesy of Pisco Portón. The timing was fortuitous, Beth and I had just had another fine meal at the legendary La Mar Cebicheria Peruana (Twitter, Facebook) in San Francisco the week prior, and we were to have a Latin American/Iberian themed party at home the next weekend. We tapped our good friend Jeffrey Sun, Proprietor of the respected Spoontonic Lounge in Walnut Creeek, CA to devise the cocktails for the night. Pisco is a very old spirit, dating back to the early 1600s in what is now modern Peru. 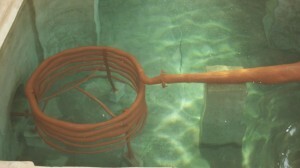 There are four government-regulated categories of Pisco: Puro made from a single grape (their version of a single varietal wine), Acholado made from a blend of grapes, Aromáticas, made from a single Muscat-related grape, and the most highly regarded Mosto Verde, made from grape must that has not completely finished fermentation. Only eight grape varieties are allowed in Pisco. Pisco is also regulated on the appellation-side of things. It can only be made from grapes grown int he 5 coastal valley regions of Moquegua, Tacna, Arequipa, Ica, and Lima. Hacienda La Caravedo is in the Ica regulated appellation for Pisco, and utilizes Quebranta, Albilla, and Torontel grapes for its Mosto Verde Pisco Portón. Heff, as we like to call Jeffrey, took to the task of crafting tasty Pisco concoctions with the glee that one would expect from a talented bartender. Before launching into the cocktail portion of our broadcast, we must try the spirit neat, however, in its native form. The 86 proof, completely clear Pisco Portón has a very robust nose, showing some shared characteristics with a few of the ultra-premium Tequilas that I’ve had in the past. The herbaceous aromas leap easily out of the glass, yet also show an interesting sweetness to that nose, touching on light vanilla and even a hint of peach blossoms and skin. With this much alcohol on board, you can expect a full mouthfeel, but it barely leaves burn and has a nice roundness to it that also belies some sweetness in the mouth, with a more distinct vanilla, vanilla blossom, and further spicy white fruit on the palate. Serve garnished with slice of lime. With a couple of these, we moved on to our Latin American/Iberian dinner and partied on into the night. Pisco Patrón was an eye-opening spirit(-ed) experience, and one that we’re likely to repeat in the future. Check out more info about this Pisco in the video below, from the master distiller himself, Johnny Schuler. Cheers! Totally using that recipe. Anything with St. Germain in it is a winner at Chez McDavis. Didn’t know much about Pisco but was curious…thanks for sharing, Ward! Thanks for the comment, girl! Yeah, I actually didn’t know that much either, but with my explorations of it at La Mar and then for this article, it was cool to learn about the depth of the spirit’s history. I have never had it naked, but I do enjoy a Pisco Sour. They are pretty good at Metro.